Jaafar gave a 45-minute performance at the 12th annual Carrboro Music Festival. It was held at the Century Center at 4p on Sunday September 20th, 2009. 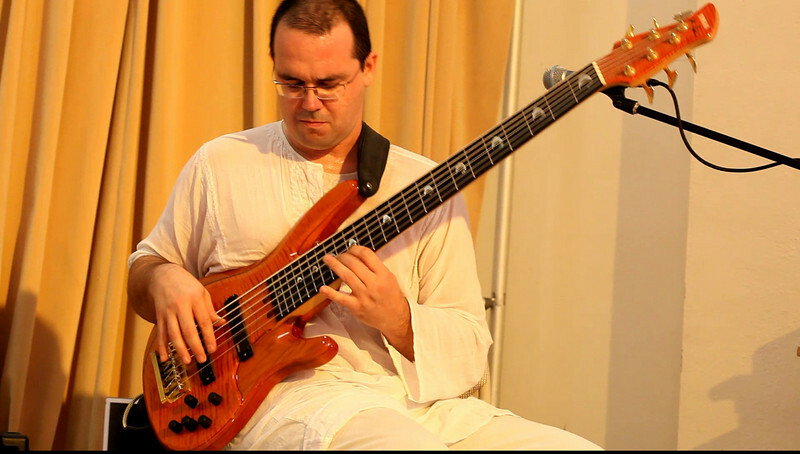 Troy Cole, Jaafar leader and bassist, was accompanied by Jay Manley on the innovative Saraswati Guitar, a custom creation with North Indian Hindustani musical influence, starting with a seven-string jazz guitar then adding on chikari sitar-like drone strings and twelve sympathetic strings. It was a contemplative, interesting, and most enjoyable performance that seemed to pass by in just a few minutes. The current gallery contents are temporary. Properly named videos, as well as still photographs, will be posted soon. All photographs and video clips here copyright ©2009 by Dilip Barman of Vibrant Memories Photography. All rights reserved.